At yesterday's meeting of the New Norfolk Council, the Warden (Hon. Ellis Dean) moved, in accordance with notice given at the previous meeting. " 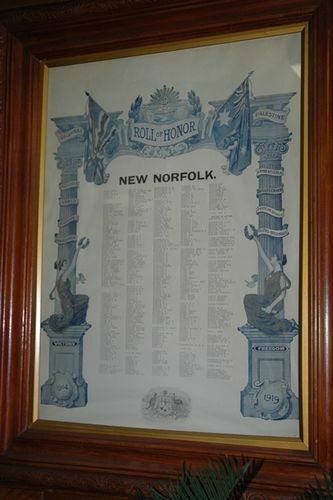 That, in the opinion of this municipal council, it is desirable that a roll of honour shall be established at the municipal council chambers, for the purpose of inscribing thereupon the names of all those residents of the municipality who have voluntarily elected to go to the front, nobly fighting for their King and Country." The Warden said did not think that New Norfolk had done all that it might have done in that respect. He did not think they had many shirkers, but a great many of the young men failed to realise the urgency of the need for recruits. He wanted those men who had gone forward to know that the council appreciated their action, and he thought it would be a strong stimulus for others to go and do likewise. Councillor Leatham thought that something should be done for those who had tried to enlist but had been prevented from serving by some physical defect. He also thought that a "roll of dishonour" should be made for those who were in a position to go, but had not the pluck. The motion was carried unanimously. The Mercury (Hobart), 12th August 1915.